As a kid growing up in the 60s and 70s I loved music. I wanted to learn piano, but with 6 people in our household there simply was not the room to invest in one. I then decided to try the guitar as it takes up less room, and although I enjoyed that instrument, I really did want to play the piano some day. Fast forward through jobs, marriage, kids and then the empty nest, I realized you are never too old to learn something new. The best part now, is that with the advances in technology, you don’t have to buy that baby grand to collect dust in the corner of your living room, although beautiful they are seriously expensive. There are digital pianos that give out amazing sounds that take up very little room and are fun to learn on. I came across this particular model while coming up with my Christmas list. I kept putting off the purchase because I couldn’t picture myself heading out to piano lessons with all the other 8 year old kids! I don’t always have a car, and I wanted to learn at my own pace. But I also thought what an affordable option. With technology now you can create awesome sounds from these digital pianos without giving up a section of your living room or totally wiping out your wallet. I always thought they would sound like church organs but I was wrong, they really do sound like a beautiful piano. This is where YouTube comes in to play. I found this video to help you get started. Lessons are nice, but sometimes it is nice to try it yourself. I am a visual person so videos work best for me but there are also lots of books on the market so that you can get started if you prefer to read first. Check out this video. This guy uses 4 chords to get you started. I know for myself, that I am more likely to keep the practice up if I see progress or at least recognize a song I am trying to play! Any of my piano playing relatives or friends will tell you that “practice, practice, practice” is still one of the most important parts of learning any instrument but especially the piano. To go from chord to chord without that pause takes some practice and time, but at least if you can play something recognizable quickly you are more likely to stick with it. If you are a seasoned piano player, check out one of these digital versions, they give a professional sound and are portable. So you can take that piano anywhere. I remember as a kid heading to a friend’s house for Christmas Carols as she played the piano and she was the only one in the neighbourhood with one! You can take it from room to room so as to not bother the household while learning. Plus you are never too old to try something new. I was thinking this model is an affordable way to get into this hobby. I have also found this book online that is for teaching yourself. 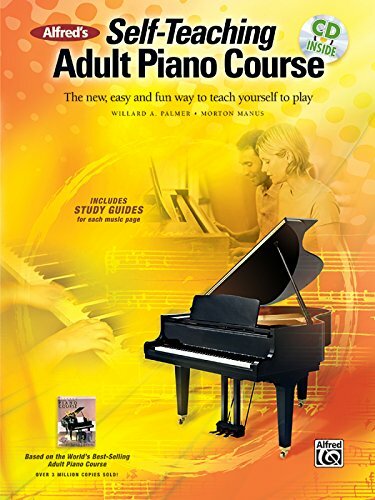 If you prefer the social aspect of piano lessons, check in your community for lessons, but if like me, you prefer to work at this in your own time frame, then videos and books can help a great deal especially in the beginning. Alfred’s is a popular brand of home teaching books for musical instruments. Give the gift of music this year.